Well, here it is. This gets my vote for the most beautiful waterfall in the region. 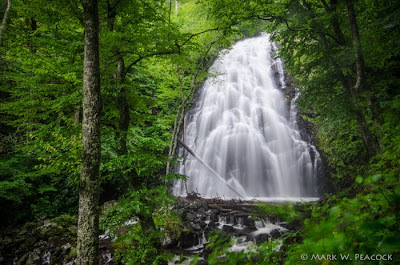 In my opinion, Crabtree Falls beats out the dozens of worthy contenders here in east Tennessee and western North Carolina. This 70 foot giant presents an awesome spectacle. The water fans out evenly across a broad span and as it rushes down it hits hundreds of tiny ledges, filling the air with a gentle rumble (as well as a lot of mist). With its many different viewing angles, it's a great waterfall to photograph. Be sure to visit when there's been enough rainfall to make the falls "full" (but preferably not too full or else you lose the tiny ledge effect). Fall and spring are the best times to visit -- and obviously an cloudy/overcast day is essential to avoid getting washed-out hot spots in your pictures. 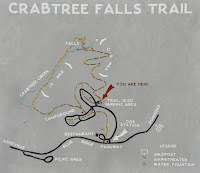 Directions: I usually go to Crabtree after visiting nearby Roaring Fork Falls and Setrock Creek Falls. So from these nearby waterfalls, I turn right onto Route 80 and go 2.2 miles to the Blue Ridge Parkway (at mile 344.1 of the Parkway). Head north for just under 5 miles to the Crabtree Meadows campground at mile 339.5 on your left (not to be confused with the Crabtree picnic area which you'll pass on your right). The campground is closed in the winter months, so you will have to park at the gate and walk the amphitheater trail or follow the road road (1/2 mi.) to the trailhead. The trail, which is well-marked, is actually a loop. 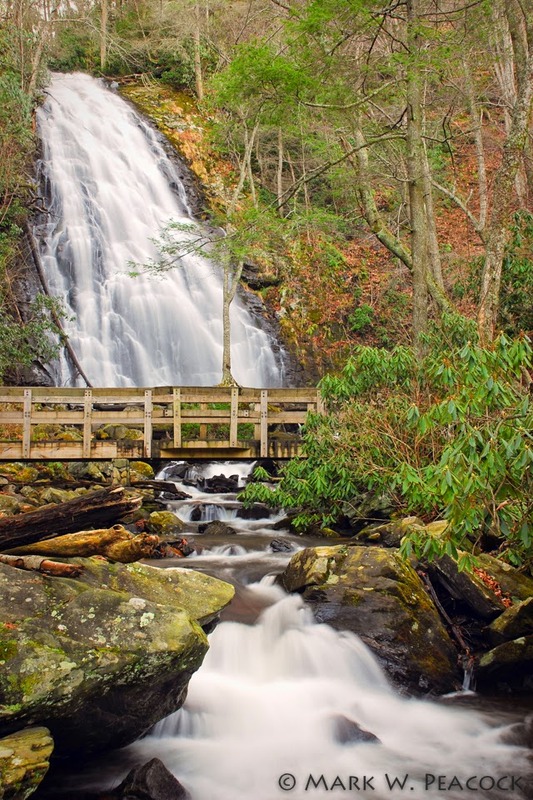 Soon after you start on the actual Crabtree Falls trail, you'll come to a fork. Turn right for the shortest distance to the falls (0.9 miles). It's moderately steep downhill and rocky. Although labeled 'strenuous,' I'd put it in the 'moderate' category on the way down and strenuous on the way back up :) -- of course, it all depends on your level of fitness, surefootedness, and experience. This is an awesome website, thank you for sharing all the info and pictures! Thanks for the info on finding this great beauty! We ventured out and got some great shots here and also at Roaring Fork Falls today! 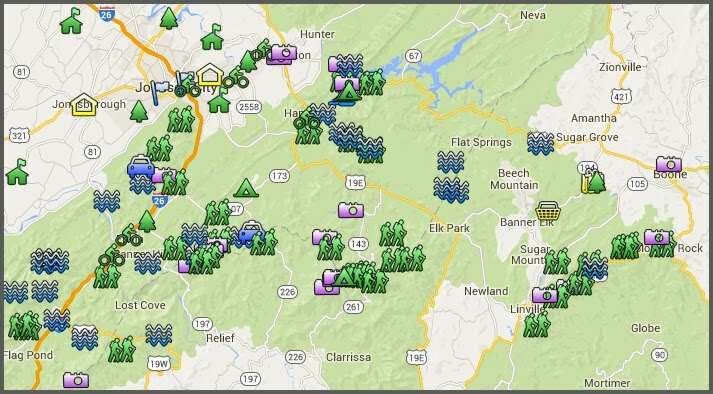 You have the best website for outdoor WNC! Keep it up! We love the photos and quotes as well. Great job! Where can I purchase your photos? You have many of my favorites marked as your favorites as well. I hate to see that Catawba Falls isn't anywhere on your WNC list. The lower and upper falls are some of the most beautiful I've seen in the area.